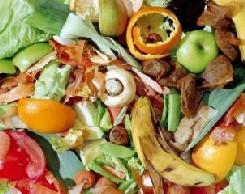 According to the U.S. Department of Agriculture and the EPA, food waste in America has grown by 50% since the 1970s. Today, as much as 40% of food produced in the U.S. is thrown away. Wasted money – over $500 per person per year. Hungry people – even in the U.S., 1 in 6 people are “food insecure”, meaning they don’t know where their next meal is coming from. Fuel for climate change – wasted food ends up in landfills, where it decomposes and creates greenhouse gases that contribute to global warming. “Food waste is the single largest type of waste entering our landfills,” according to EPA Acting Administrator Bob Perciasepe. At the national level, the U.S. government launched a “U.S. Food Waste Challenge” this past June. It calls on both the public sector and private industry to find ways to reduce, recover and recycle food waste. In 2011, an alliance of food industry companies, including the Grocery Manufacturers Association, announced a 3-year initiative to cut food waste and reduce the amount of food sent to landfills. They would also increase donations to groups that feed the hungry. This initiative is co-chaired by General Mills and our very own Lakeland, Florida based Publix Supermarkets. In Tampa Bay, the Whole Foods site offers this post on “12 Ways to Stop Wasting Food.” Some great ideas here! My family sometimes struggles to finish foods before they go bad. We have learned to love soups and omelets for dinner, in order to use leftovers of all kinds. Our next frontier will be composting food scraps instead of putting them in the trash. How about you?